After an adventuresome time in Durham, North Carolina, where I consumed delicious local brews, lost at shuffle board, ate so many southern dishes, visited Duke’s conservation lab, toured a lemur center and discovered that I’m still allergic to mosquito bites, Henry and I embarked on our drive to Charleston, South Carolina. Upon our arrival we were greeted by Tropical Storm Julia, but luckily the next few days proved to be quite lovely with very little rain. 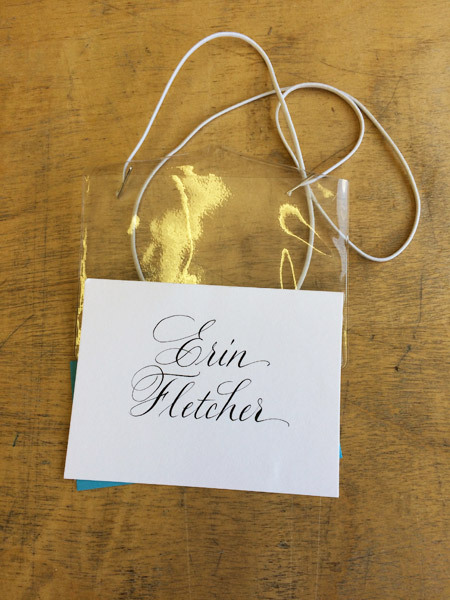 After checking in, I began to rummage through my conference packet and found my name tag, which was beautifully done by local calligrapher Elizabeth Porcher Jones. The conference began with a tour to the Charleston Library Society, an absolutely charming space that also served as the venue for the opening reception later that evening. Our tour began with Anna Smith, Special Collections Librarian, who gave us an overview the Society’s establishment and shared a few treasures from their collection. 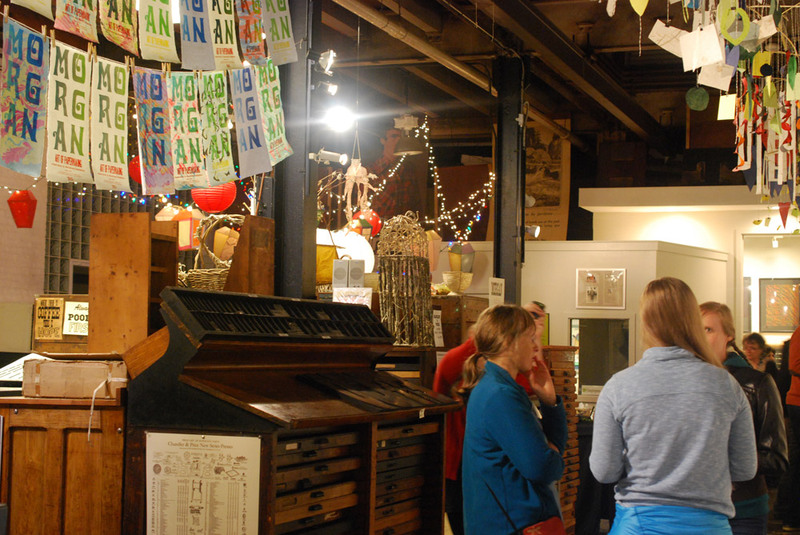 We were then led to the first floor by Kerri Harding, Director of Bindery and Conservation Studio, where she showed off their delightfully quaint bindery space. 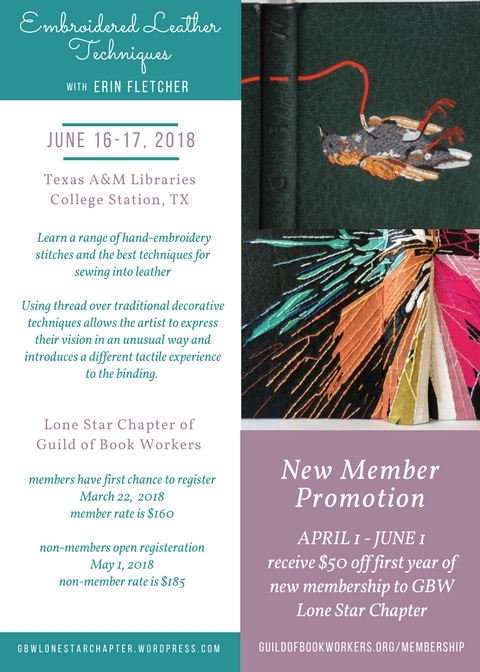 Having just relocated to Charleston, Kerri shared with us the range of her upcoming projects: a presentation leather binding, rehousing and holiday ornaments showcasing the Society’s newest titles. The first presentation of the conference was Drawn to the Writing given by calligrapher Cheryl Jacobsen. 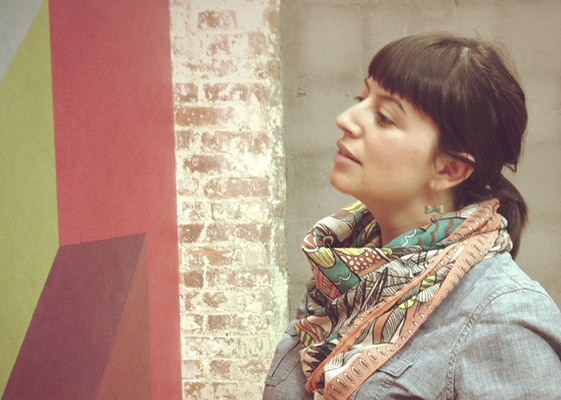 As a freelance artist living in Iowa City, Cheryl’s work ranges from design and lettering to illustrations and art. She began her presentation with her personal history on how her interest in art and lettering developed before going into a slideshow of her work. Cheryl is also an adjunct assistant professor at the University of Iowa, teaching courses at the Center for the Book. Over the course of the presentation, Cheryl created a certificate to commemorate the conference using a variety of letter forms. She spoke about line formation (this included pressure and hand position), nib use, ink/pigment preferences and tricks of the trade. At the end of presentation, the audience was rewarded with a copy of the certificate Cheryl produced during the presentation (she even offered to add your name to the certificate). We were also allowed to handle some of her artist books. For the afternoon presentation, the topic switched to bookbinding in Exploration of history and techniques for Pennsylvania German Liturgical Bookbinding before 1850. 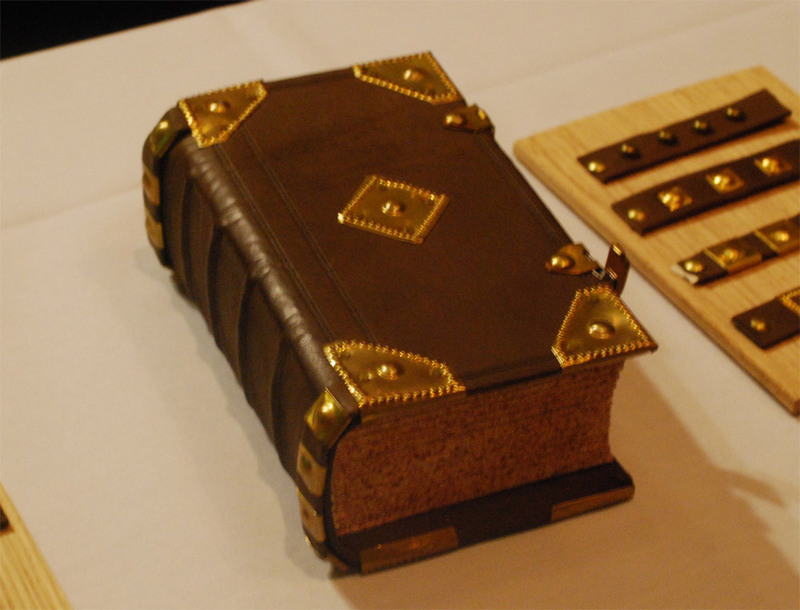 The presentation was divided into two parts: Chela Metzger, Head of Library Conservation at UCLA, demonstrated the construction of the binding and Erin Hammeke, Senior Conservator at Duke University, demonstrated the techniques used to create the bosses and clasps traditionally seen on this style of binding. Chela quickly went through the construction of the binding. The book used in the demonstration was sewn in an abbreviated pattern (usually 2-on) using thicker supports (usually two supports as one), the shoulders are quite narrow and the edges were (historically) ploughed. The wooden boards (oak or beech; usually quarter-sawn) are heavily shaped along the spine and fore edge on both sides of the board. 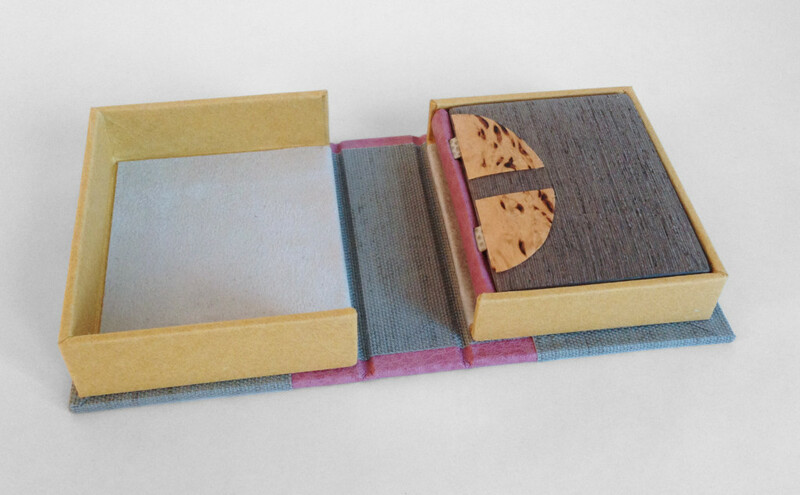 The fore edge is also notched in preparation for the clasps. 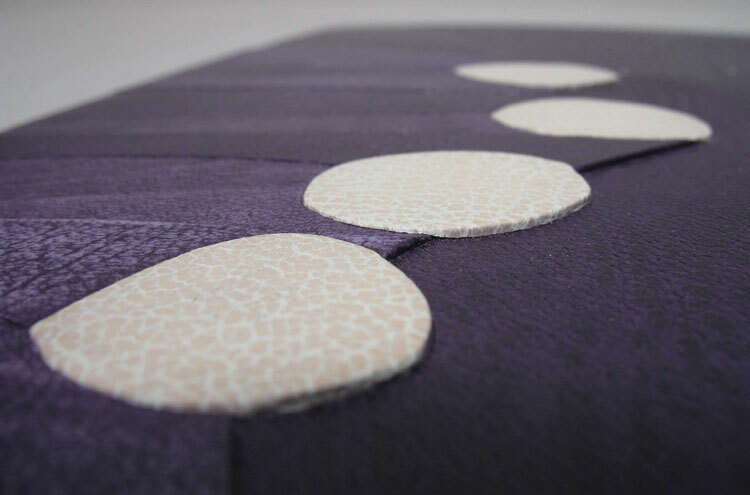 The spine is lined with linen strips that extend beyond the shoulder. Unlike most wooden board structures, the boards are not laced-in. The sewing supports are frayed and adhered to the first and last leaf, then the linen is adhered to sandwich the frayed cords. The text block edge is colored after the boards are attached, then the hand-sewn or hand-woven endbands are stuck-on. 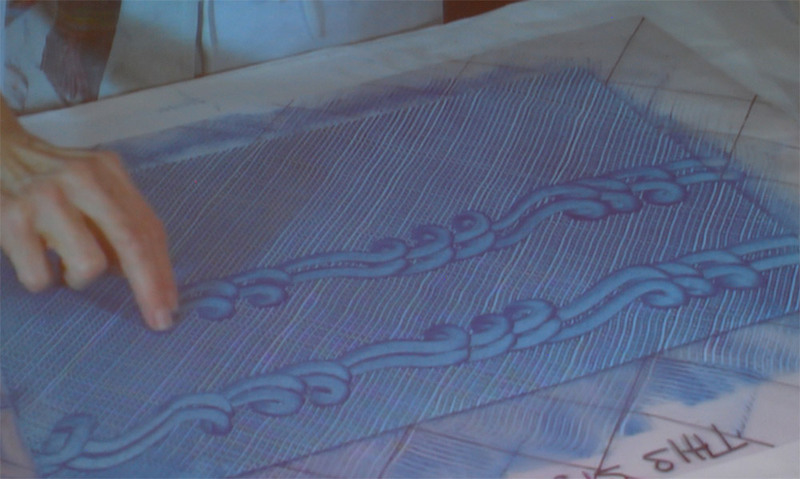 One of my favorite parts of the presentation was the brief demo given by Chela on the technique behind the woven endbanding material. Using a make-shift back-strap loom (popsicle crafts! ), she wove a traditional white and blue endband strip. A variety of endbands have been spotted on these bindings. The image below (on the right) shows just two varieties with the hand woven style on the bottom. Chela’s portion of the presentation continued with the covering of the book and tying up the spine (this step ensures that the leather adheres to either side of the supports). 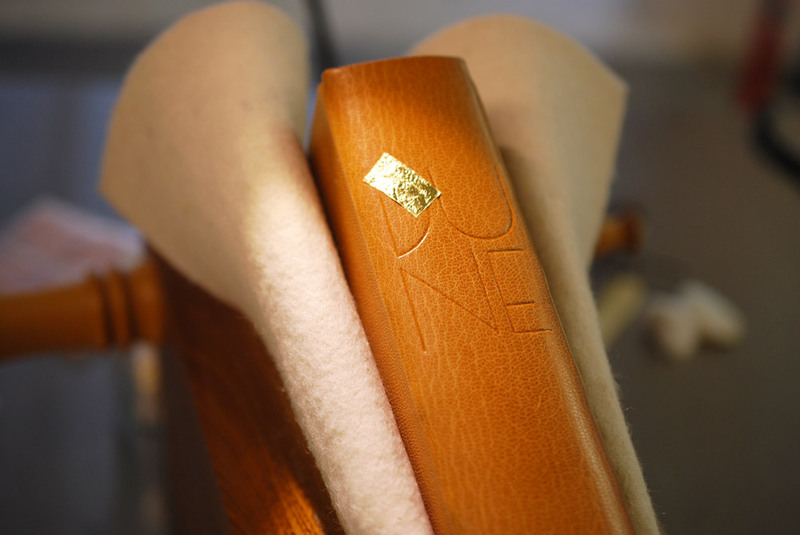 The last step presented by Chela is one of the defining characteristics of this binding: the leather spine straps. Appearing on the spine at the head and tail (and sometimes the middle) many examples are seen adorned with brass studs or domes. Using a 24-gauge brass sheet, Erin demonstrated the process for creating the corner pieces for the binding. Beginning with a flat piece of brass, Erin roughly traced out the design with a sharpie. Then she cut down the brass close to her design with metal snips; shaping it even further with needle files and emory paper. Supporting the brass with a lead block, Erin began to decorate the brass corner piece by striking the back with steel punches. This did not create a hole, rather pushed the brass into a shape that would be raised on the front side. 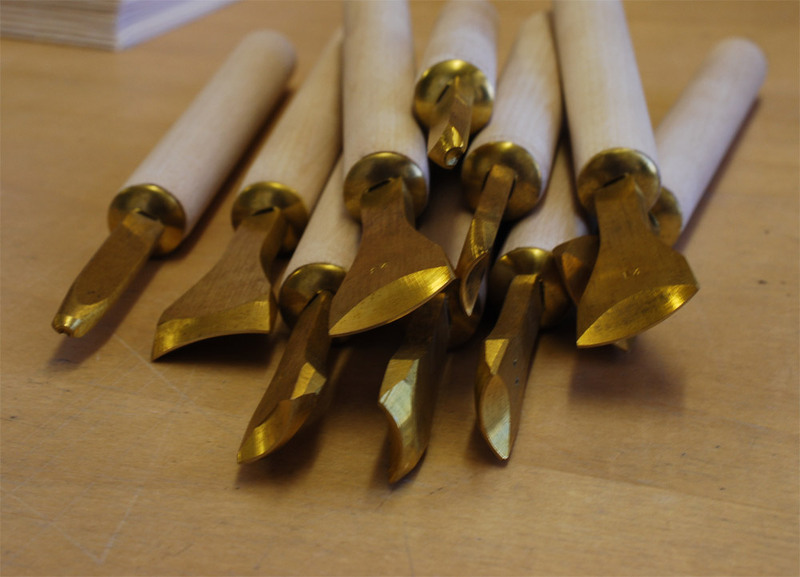 In the image above (on the right), Erin uses a drill to create holes where the nails will be inserted when attaching the furniture to the book. After attaching this corner piece to the book, Erin began to bend the extended brass around the edge of the board with her fingers and finished its shape by striking the brass with a planishing hammer. Day two ended with a social gathering at a local pub for a Mentor-Mentee Happy Hour, those new to their field were encouraged to speak with the more accomplished participants. Afterward, I broke off with some friends for a very quick bite to eat before going on a Ghost and Dungeons tour through Charleston. One the third and final day of the conference, two more presentations were given. The morning presentation was given by Betsy Palmer Eldridge on Paper Conservation Treatment Revisited. 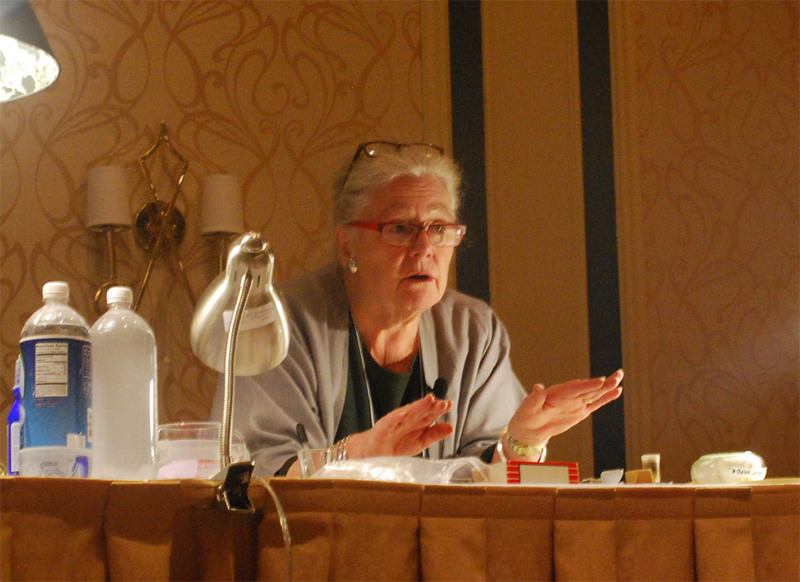 In 1989, Betsy gave a presentation at the Standards conference in Portland, this year she presented a revised version of that lecture. 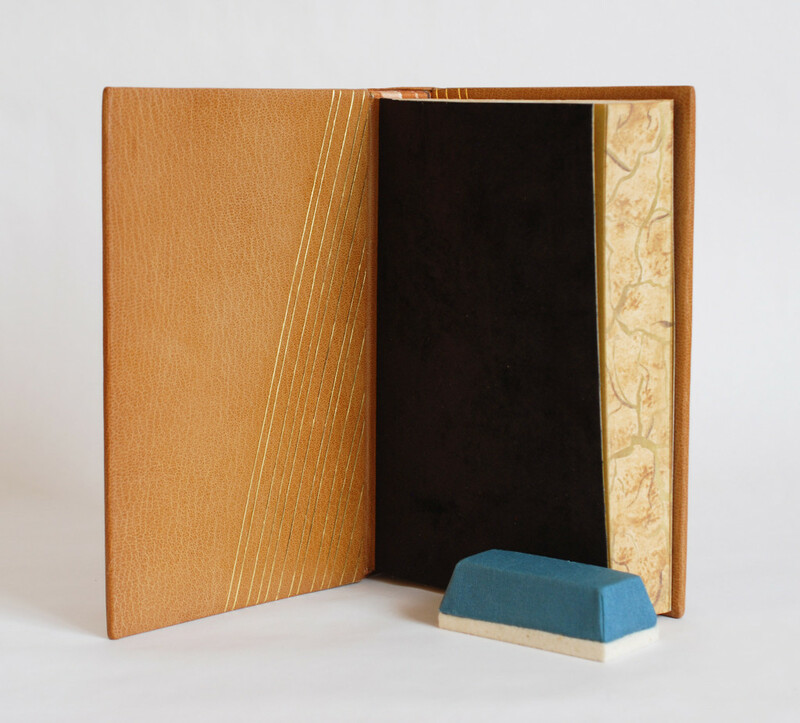 Betsy was introduced to book arts during her time at Wellesley College in 1957 and further advanced her training in Germany and France. In 1973, she moved to Toronto, where she established and maintained her private conservation studio. Betsy has been an active member of the Guild since 1960 and the Canadian Bookbinders and Book Artists Guild since 1983. Betsy gave an overview of a variety of conservation techniques and tricks she has picked up along the way. Many of the presentation materials she referred to were used in her original presentation 27 years ago, it was quite interesting to see how the materials had changed or retained their vibrancy over the years. 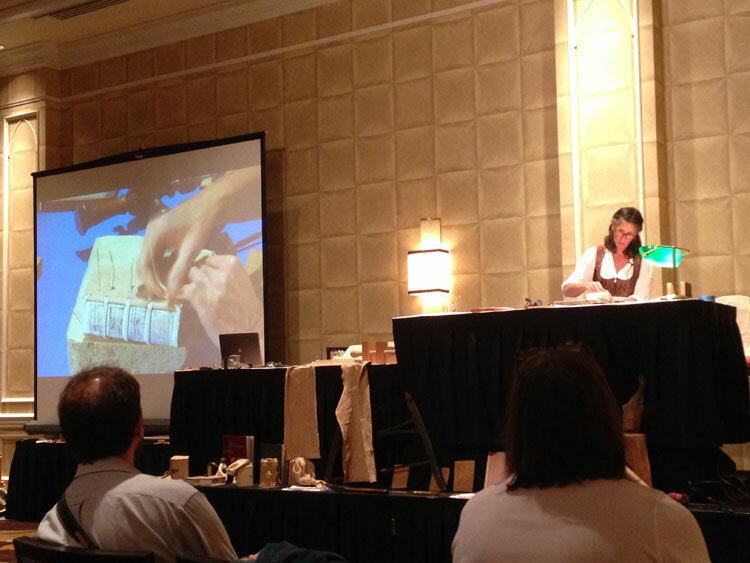 The final presentation was on Herrnhuter Paste Paper given by Deborah Evetts. At the start of her presentation the audience received a brief history lesson paired with images of these papers collected from several sources. During the last third of the 18th century, a group of Moravian sisters living in a religious community at Herrnhut in Saxony created what came to be a very recognizable style of paste paper. The sisters traditionally used olive, bright or grayish blue, mustard yellows and reds in their papers. Deborah has seen several examples and has recreated tools to mimic the patterns seen on these historical papers. 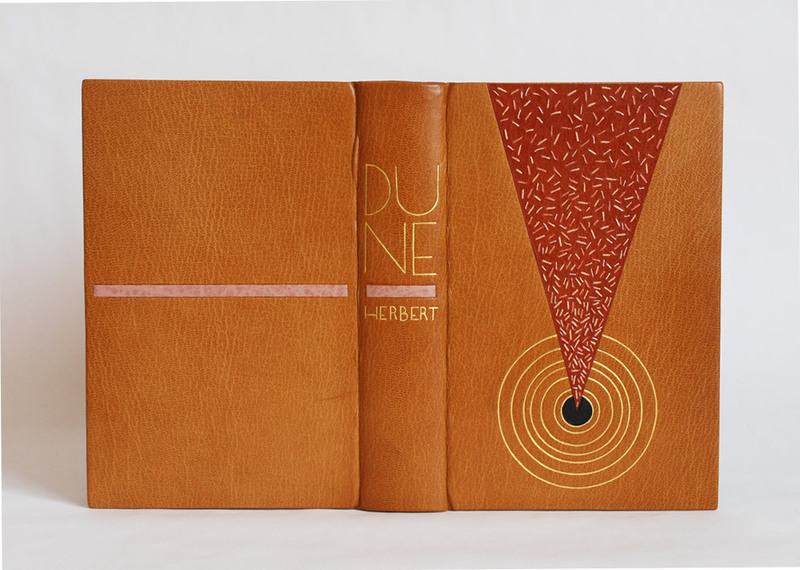 Herrnhuter Papers were used as both cover papers and endpapers on many common types of books such as ledgers and almanacs, but examples have also been found on works of literature, non-fiction and other genres. After the slideshow, Deborah moved onto discussing tools and paste preparation. She began with a quick demonstration on making your own tools such as combs, rolls and mylar templates. The first image below shows Deborah marking out a small piece of plastic and then cutting out the teeth using a sharp scalpel blade. Combs can be made from binder’s board, plastic container lids or vertical blinds. 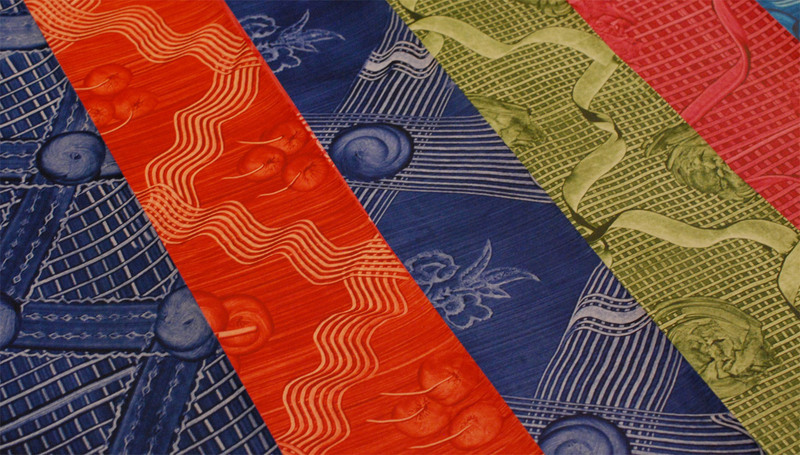 The second image below shows three different styles of paper that utilize the same decorative roll and the handmade rolls that Deborah has made. The designs were carved out of linoleum and attached to craft rollers. Over the course of the presentation, Deborah created several styles of the historical patterns seen on Herrnhuter Papers. She demystified so many patterns. One in particular that I was excited to see was the two-finger swirl. The crowd gave Deborah a round of applause after each paper blossomed before our eyes. Deborah was so delightful and high-spirited in her presentation and it was a great way to end this year’s series of presentations. At the end of the evening, we all gathered in the Colonial Ballroom at the Francis Marion Hotel for the banquet and live auction. Also during this time, two members of the Guild are rewarded with the Laura Young Award and the GBW Lifetime Achievement Award. Catherine Burkhard was awarded the former for her dedication and long-time service to the Guild. 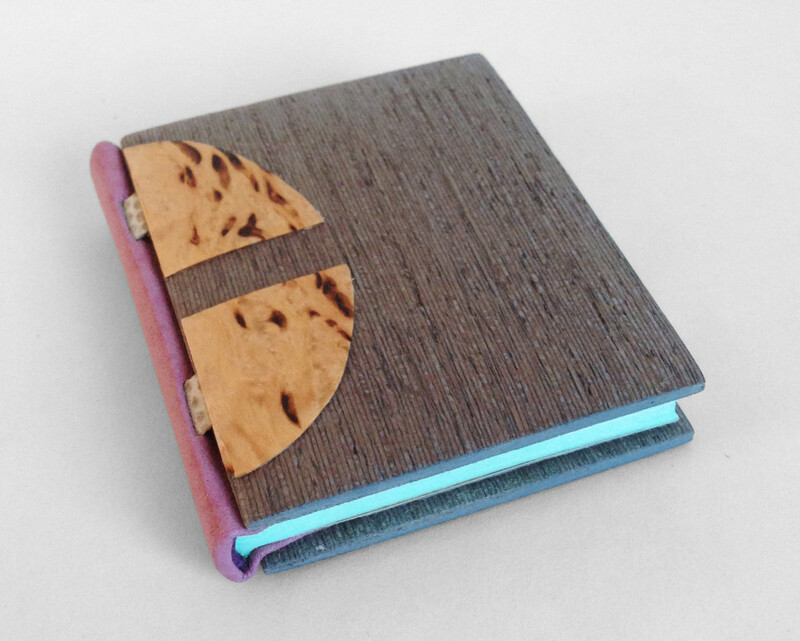 The latter was awarded to Peter Verheyen, celebrating his achievements in the fields of conservation, bookbinding, book arts and creating a thriving online community. As the night came to a close, I allowed my nose to be traced, said my goodbyes and wished everyone safe travel back home. Looking forward to next year’s conference in Tacoma, Washington! I am on my way to Charleston, South Carolina for the annual Standards of Excellence Seminar put on by the Guild of Book Workers. My trip begins in North Carolina with fellow guest bloggers, Henry Hébert and Jeanne Goodman. This will be my second trip to North Carolina and my first to South Carolina. I’m looking forward to traditional Carolina barbecue, lemurs, exploring the southern landscape and oh, yes all things books. 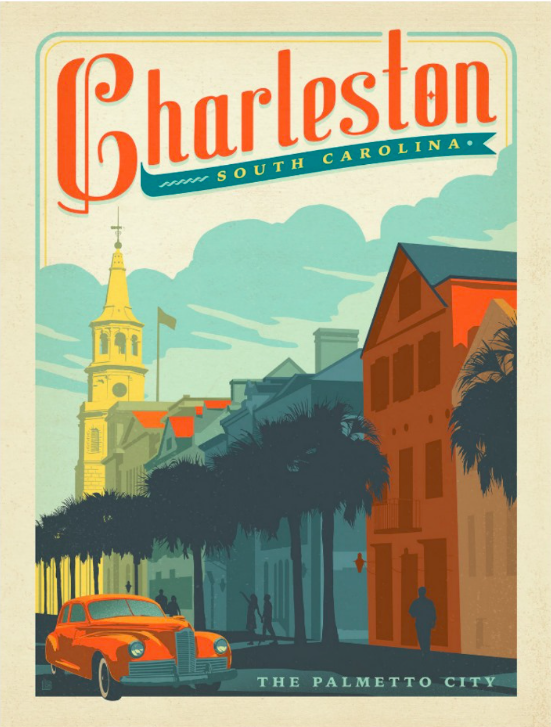 This year I’m looking forward to touring the Charleston Library Society, the presentations (particularly the ones given by Chela Metzger & Erin Hammeke and Betsy Palmer Eldridge) and the vendor room. I’ll be writing a review of the seminar shortly after I return, so look for it around the end of September. It’s time again for the Guild of Book Workers annual Standards of Excellence Seminar. 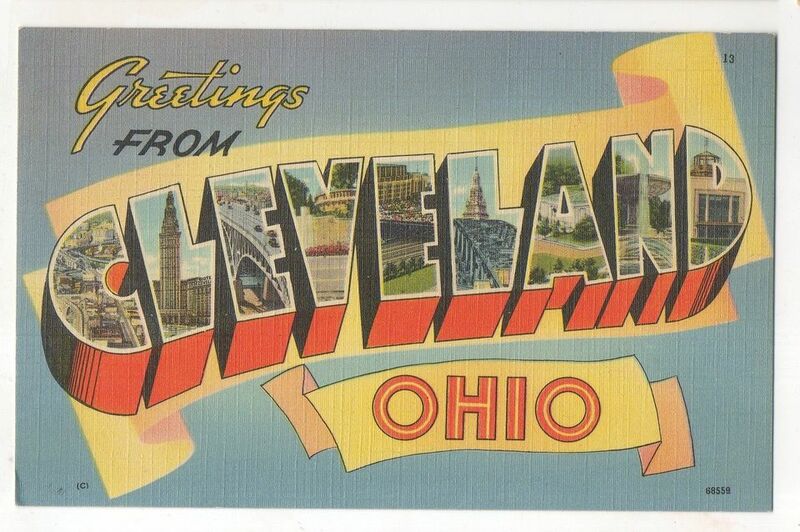 This year it will be taking place in Cleveland, Ohio. This will be my first trip to the city known as the home of Rock and Roll (perhaps I’ll make a trip to the Rock and Roll Hall of Fame). But most of my time will be spent mingling with delightful bookbinders and conservators while attending informative presentations and spending all my money in the vendor room on leather skins and other irresistible goods. I’ll be writing about my experience at the Seminar upon my return mid-October. Check out this delightful promotional video from the Guild of Book Workers. It was filmed during the 2014 Standards of Excellence Seminar in Las Vegas. The Guild of Book Workers has a unique appreciation for its younger members and really encourages the growth of all its member through dedicated support and access to information. Sol Rébora bound this special one of a kind text by calligrapher Nancy Leavitt after a serendipitous meeting. 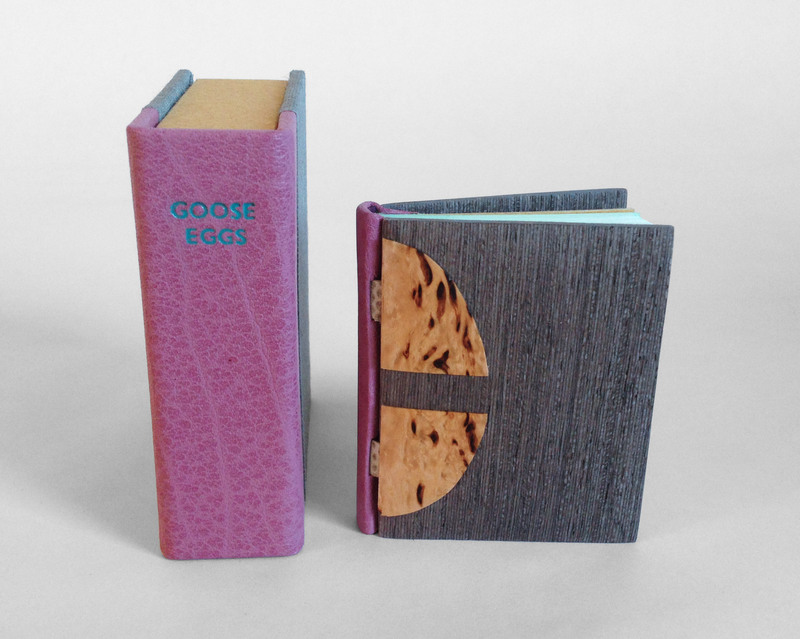 The book is bound in the French-style of fine binding in full violet goatskin. The decoration is divided into six levels with onlays in purple and white goatskin. 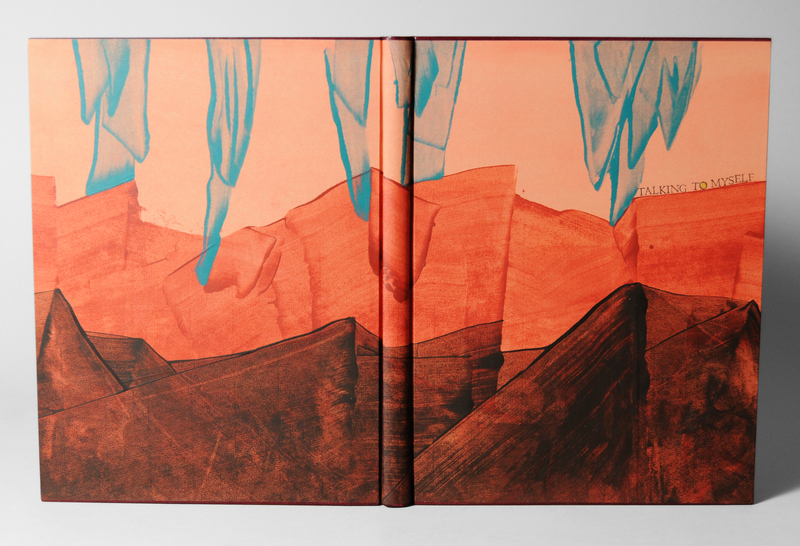 The text within this binding is a special edition by Nancy Leavitt. 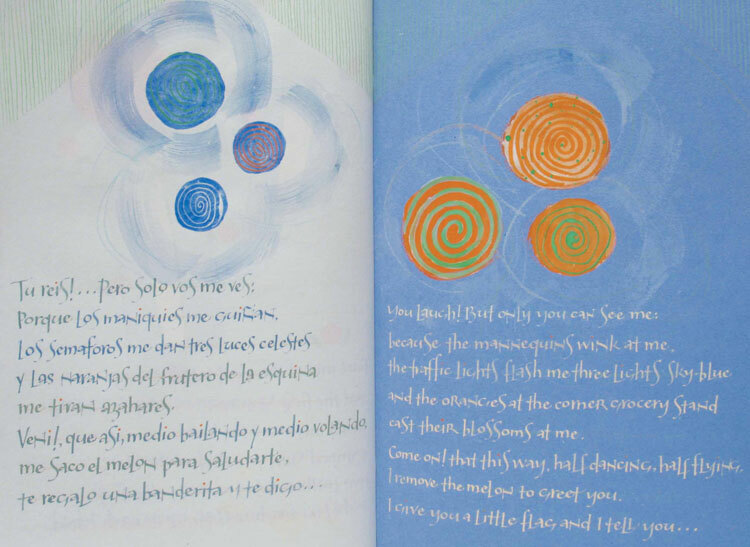 Do have a connection with Nancy, who is a calligrapher and book artist based in Northern Maine? I met Nancy in New York in 2006, at the 100th Anniversary Guild of Book Workers Conference. I love her work and I like her very much; she is really a beautiful person and a great artist. I proposed to her that we make a book together and she accepted; so we started to work on it. We looked for a topic which we both like to work with and [settled on the subject of] Tango. After some research we chose [the popular song] Balada para un loco [by poet Hector Ferrer]. Sometime later she had finished the book, she sent it to me by mail, and I worked on the binding. Both of us worked totally free on our feelings. Nancy found a way to make a translation, which is very difficult for Tango. 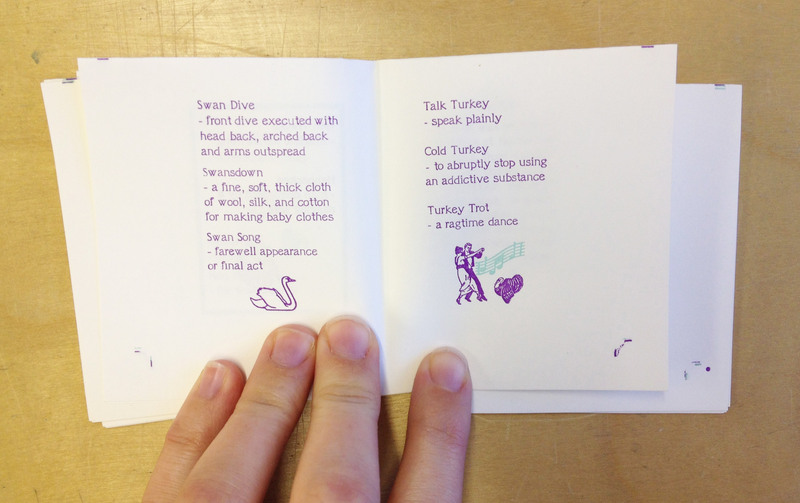 With the text and the song, she found a base to create the book. Later I bound the book, working with the same process I use for every design binding, but with the plus that I had been part of the creating process of the text in some way. I sent the design to Nancy before I began, (even if she didn’t ask it) and she liked it very much, so I started to work on it. Did you find inspiration in the text or do you draw from another source? To explain my way to work on a design or to find inspiration I have quite a clear process of work. – Typography: The design of the typeface, its predominant form, size and color. – Print Layout: Book cover, typographic case and blank surfaces around the text. – Paper: Color, texture and paper weight. – Illustrations: Techniques used for illustrations, predominant color, size and quantity thereof. – Size and shape of the book: I observe the size of the book, number of booklets [signatures], leaflets or free sheets, and finally the weight of the book. – Structure and construction process: What may be the most appropriate structure and format and sewing by weight. – Materials to use: wire, paper, paperboard, leather, fabric, or alternative materials such as acrylic, wood, metal, etc. – Textures: Choosing textures in every material used for union or for opposition to the qualities that brings the book. – Colors: Colors of the materials I decide to use. – Design: Drawings, designs, models, colors and material testing. I think the openness and the preservation are the most important points on the construction process of a contemporary design binding, together with “good techniques and aesthetic criteria”. These are technical conditions that a binding should have to preserve the criteria that the book brings from the edition, which is accompanied by an aesthetic thought of form and color text, based on the text, work which is responsible editors, designers and illustrators. 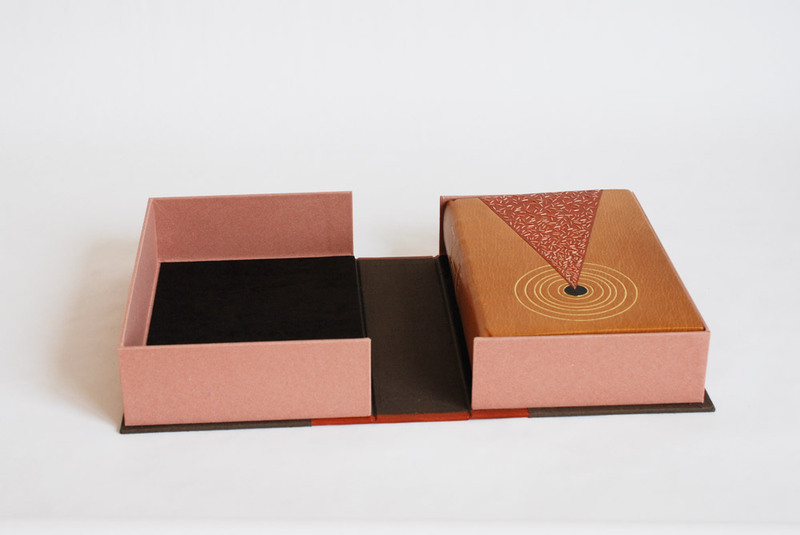 The design and the aesthetics or the artistic expression of the binding should be integrated to create one piece with intellectual and sensory reading from the outside. Finally, I would say the construction techniques of the structure, along with the design of the cover and applied materials, play together to achieve this unit. 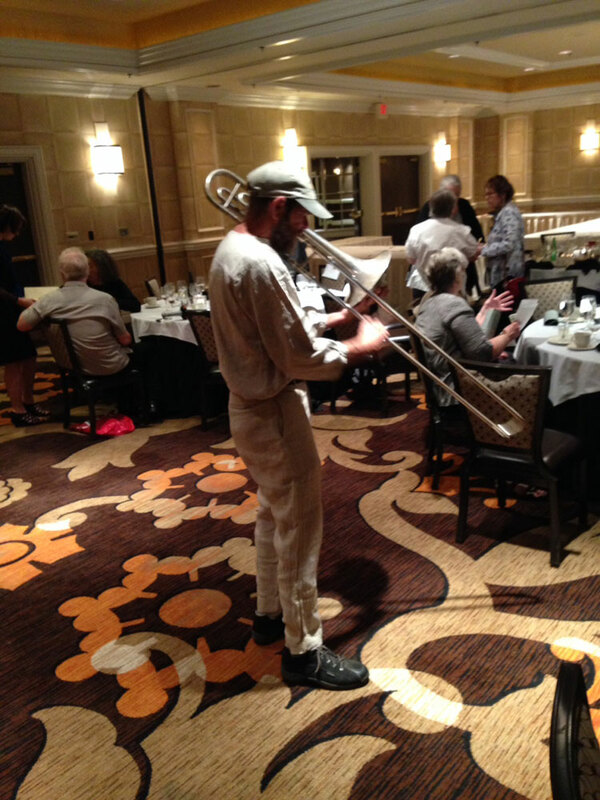 The 2014 Guild of Book Workers Standards of Excellence Seminar was located in Las Vegas at the Excalibur Hotel. My initial experience of the city was enchanting. As my first trip to Las Vegas, the lights and sights were captivating and surreal. The city is constantly bustling with excitement and anticipation. However, these abstractions of Vegas began to weigh on my experience. Despite the circumstances, I thoroughly enjoyed myself at the Seminar and within this post I will present an overview of the events. Each Standards of Excellence Seminar includes a tour. The conservation lab at the University of Nevada, Las Vegas invited the attendees to view their facilities and see an overview of their collection, means of repair and exhibits. The official start of the Seminar occurred later that day with an opening reception at the University outside the Barrick Museum. We gathered outside in the warm weather to some treats and libations. The museum was open to us as well and featured a selection of contemporary 2-d and 3-d art juxtaposed with an exhibit of baskets from the Southern Paiute and Shoshone of southern Nevada. The reception is a great way to see who is attending and offers an opportunity to rekindle connections. There are a variety of people whom I connect with every year at Standards, which is one reason I love to attend the Seminar. The first full day of the Seminar included two of the four presentations and ended with a Mix and Mingle event. In addition to those happenings, is the the vendor room. 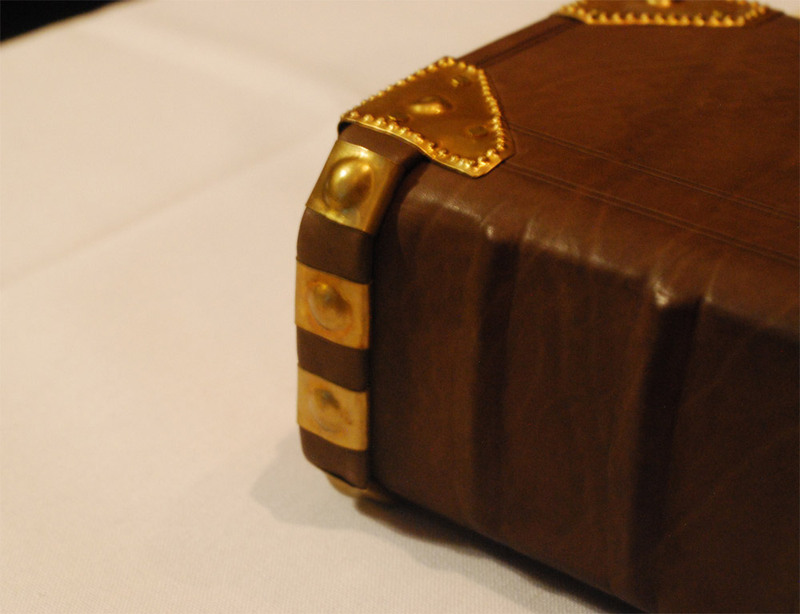 Each year the vendor room is filled with colorful leathers, handmade papers, bindery tools and more. There are many vendors who are staples of the vendor room and many who are new to the crowd. I’m always pleased to chat with the vendors, it’s so wonderful to have a personal relationship with the people who supply our materials. But on to main event: the very first presentation was by Emily Martin. 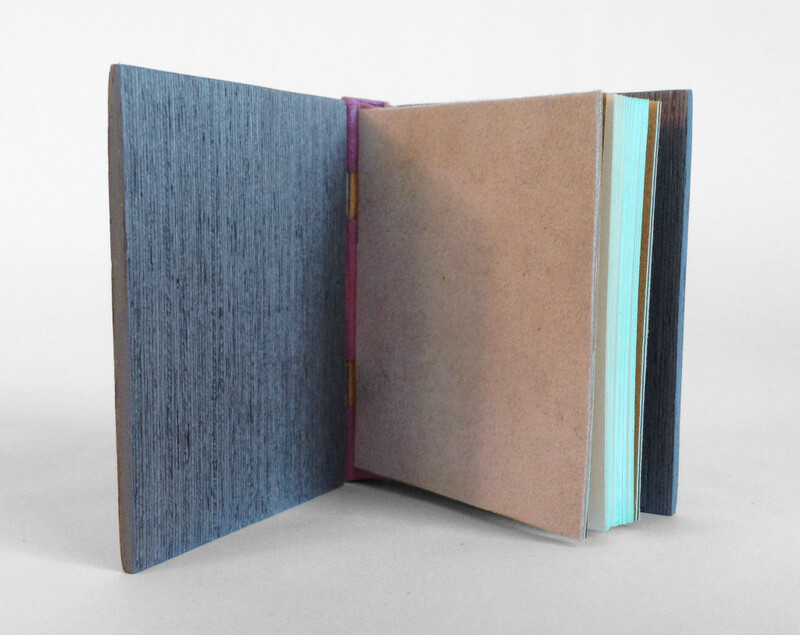 Emily’s artist book, The Tragedy of Romeo and Juliet, was a Distinguished Winner for the Designer Bookbinders 2013 International Bookbinding Competition and became the subject of her presentation on Carousel Books. 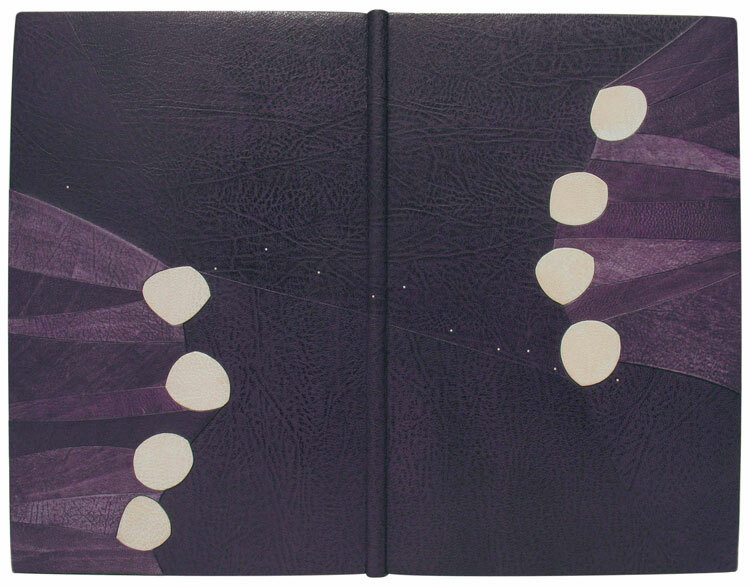 This style of binding was first used in the 1930s becoming more popular after WWII. There are two main types of carousel books: 1) floor and wall and 2) window (or starbook). Emily’s presentation was so well executed as she demonstrated how she created a hybrid of the two types for her Shakespeare book. Her instruction was easy to follow as she demonstrated her creative process and the steps for constructing an elaborate carousel book. One other element that I enjoyed from Emily’s presentation was her use of trace monotype as a means of creating illustration. The second presentation was on Parchment Over Boards from Peter Geraty. This is a structure that I have learned directly from Peter, while I was a student at North Bennet Street School. So Peter’s presentation was a wonderful refresher to a structure that I am currently working on in my studio. 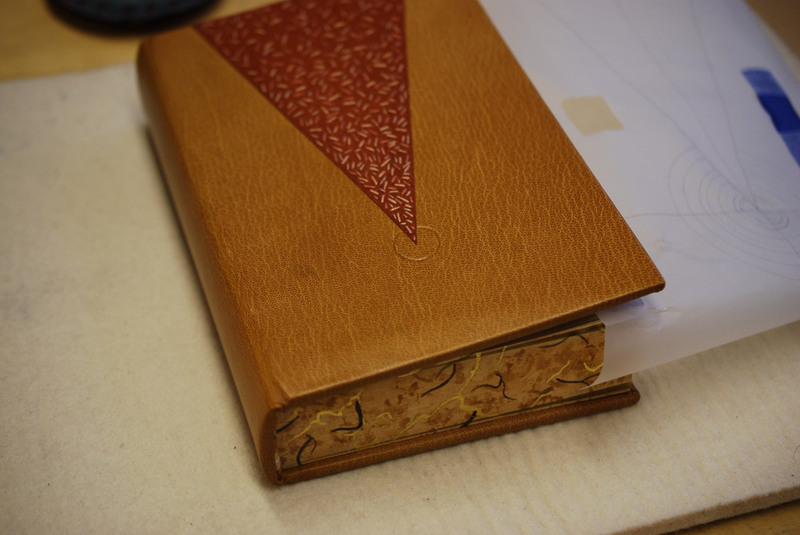 Due to the short-time frame of the presentations, many of the steps had to be rush through, but Peter did a wonderful job of completing the major parts of the binding. It was particularly nice to see how to shape the headcap, which can be quite difficult when working in parchment. The first full day of the Seminar ended with a Mix and Mingle event, which is an informal way to show off your more recent work to the fellow attendees. 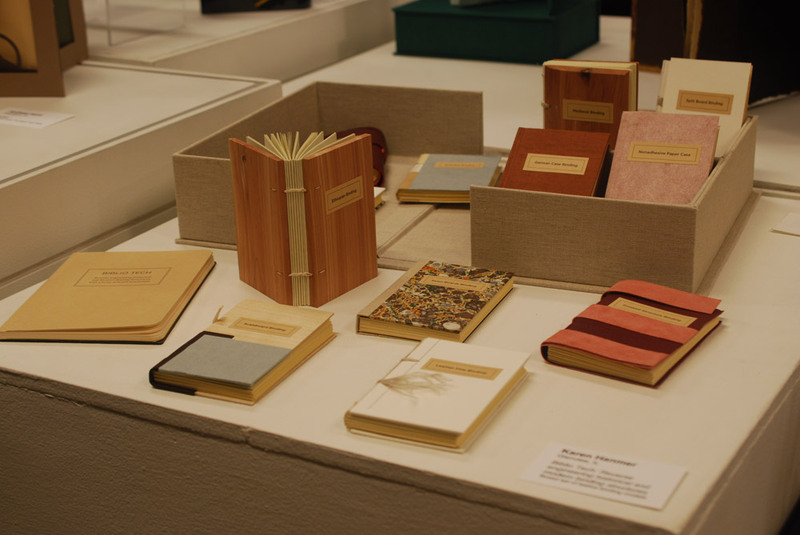 A few tables were filled with a variety of book related projects from miniature bindings and finely printed artist books to handmade tools and fine bindings. It’s always delightful to handle books and have the opportunity to speak with the craftsperson about their work. This Mix and Mingle event is quite a new addition to Standards, only happening once before at last year’s Seminar, but I hope it will continue. 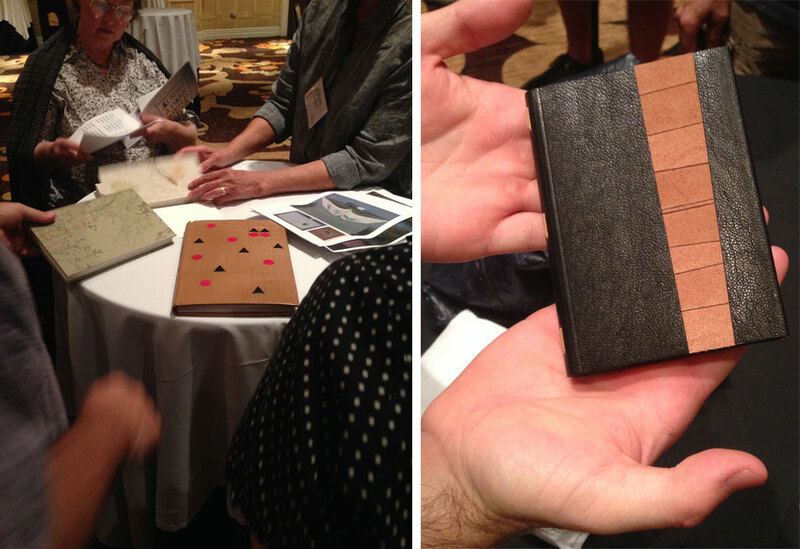 It’s a wonderful way to engage in creative conversation with fellow bookbinders and conservators. At the start of the second day of the Seminar was a presentation on Historical Letterlocking by Jana D’ambrogio. I really enjoyed Jana’s presentation because her enthusiasm for the subject of letterlocking was quite infectious. She presented on several letterlocking variations, detailing the folds and locking techniques used in order to secure a letter of importance. And there were quite a lot of variations from using the same material to create the lock, penetrating through all folded layers, pleating, triangular lock, the penguin lock and using wax seals. Every locked letter that Jana demonstrated was based on an actual letter, that had been deeply researched and investigated by Jana herself. She has traveled all over the world viewing various letters to decipher their letterlocking structures. All this research is just the start of a new database of information and a new lexicon on the habits of security during the 15th – 16th century. Jana wrapped the audience into her presentation as we were tasked to unlock our own letter. She also demonstrated a quick and easy way to lock a letter into a triangular shape, which can be sent through the mail even today. To wrap up the day was the final presentation on the Traditional Medieval Girdle Book given by Renate Mesmer. 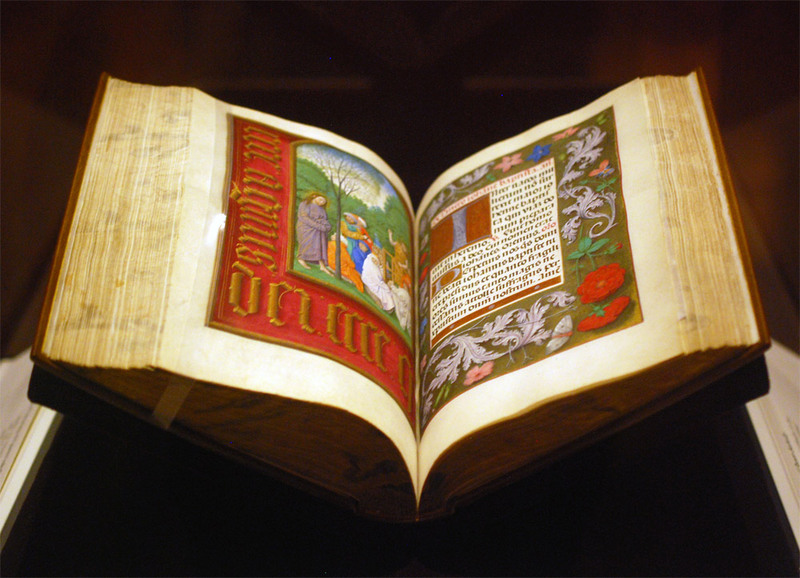 In Germany the girdle book is called Das Beutelbuch and was a symbol of faith or status within society of the 15th century. The texts were either religious or legal. 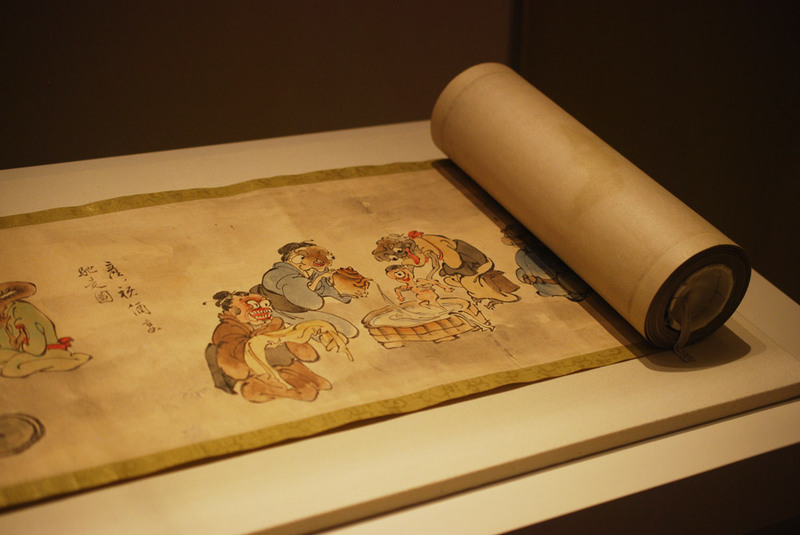 Around 800 girdle books can be found in art, yet only 23 physical examples are known worldwide (most in Germany and only 14 in their original cover). 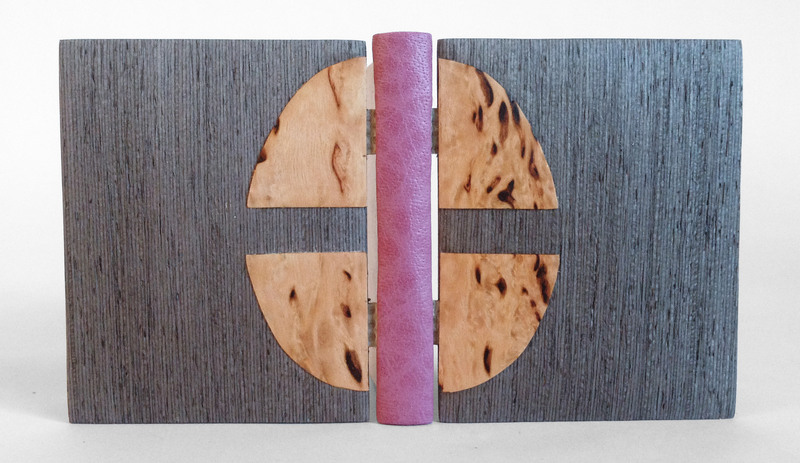 The structure of the book is similar to most 15th century wooden board bindings, there are so many variations to the sewing pattern, sewing support, endpapers and spine linings. Renate demonstrated the construction of the binding before moving on the creation of the girdle and Turk’s head knot. Renate also engaged the audience’s participation by attempting to teach us the Turk’s head knot using a bouncy ball and a long, thin piece of leather. It was quite difficult to say the least. Throughout Renate’s presentation, the audience was enchanted by spurts of medieval knowledge from Jim Croft, who joined the stage to discuss wood and brass hinges. The final event of the Seminar is the banquet, this year attendees were invited to dress in medieval garb (which is why Renate is dressed so appropriately during her presentation). And thanks to my classmate, Caitlyn Thompson, many of the NBSS students and alum donned hand-crocheted crowns. During dessert, the Guild’s President Mark Andersson, presented the Laura Young Award to Julia Miller and the Lifetime Achievement award to Sam Ellenport. The former is presented to someone who has served the Guild in an outstanding manner. 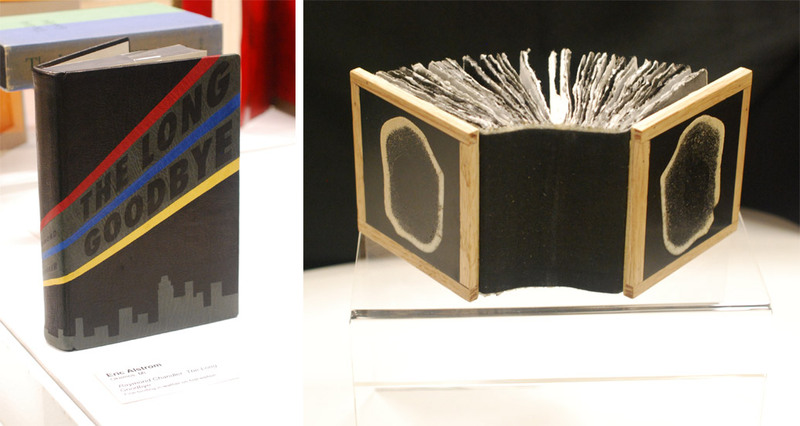 The latter award was presented to Sam Ellenport for the countless ways he has influenced the field of bookbinding. 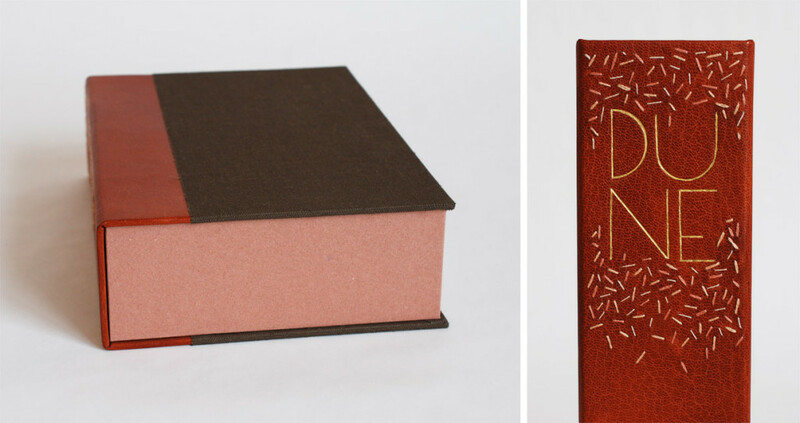 Many people have been affected by his influence, for example, Sam was instrumental in created the bookbinding program at North Bennet Street School. Following the food and awards, is the real excitement of the night: the auction. Scholarship winners parade around the room with the items up for auction and excitement ensues amongst the crowd. I was delighted to participate this year for the first time and walked away with two beautiful pieces of suede that were so gorgeously decorated and altered by Coleen Curry. And thanks to Colin Urbina, I also got a dogtooth burnisher. My night ended with several goodbyes, some lovely music from Jim Croft and an excellent show and tell from Don Glaister. Although, I was eager to leave Vegas, I had a wonderful time at the Seminar. Looking forward to seeing all my book friends and colleagues next year in Nashville.